Field Day is an annual ham radio event that encourages operating in the great outdoors. It’s “amateur radio’s open house,” a great opportunity to learn about the hobby and meet your neighborhood hams. There are two local transmission sites we encourage you to visit. Members of SPARC will be on the air with fellow hams from the Pasadena Radio Club, JPL RC and Caltech RC on the campus of Art Center College of Design. 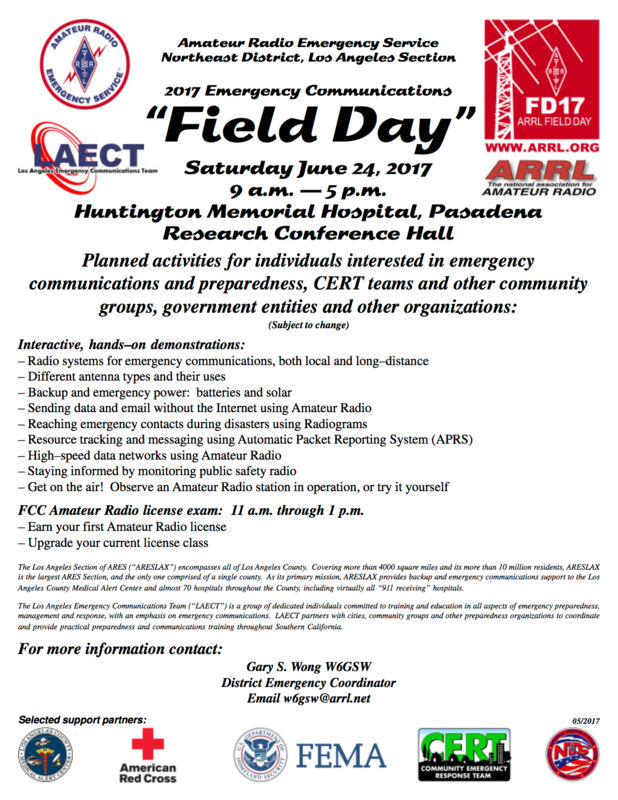 Sunday, June 25, 11:00 a.m.
We will join our friends from Altadena Emergency Radio Team and ARES Northeast at Huntington Hospital. Saturday, June 24 9:00 a.m. to 5:00 p.m. This entry was posted in Events, News on May 18, 2017 by John Aboud.